Nowadays, children are very familiar with technology. It is not strange to see toddlers playing with their parent’s tablets and smartphones, and kids as young as 10 are getting their own devices. While this exposure to the latest gadgets can give children many advantages, it can also put them at risk. A mobile device can be very practical for communication and education, but it can also be used to access content that may be inappropriate for kids. Cyber-bullying has also become a big threat and unfortunately, many children are targeted. In addition, predators may use social media websites and instant messaging apps to approach kids. In summary, parents need to be alert and protect their kids from the dangers that lurk online. One of the most practical solutions to keep your children safe is to use a monitoring app that allows you to see how they use their smartphone. Spyzie is one of the many options available and in this review, we’ll find our more about it. Spyzie is a practical solution to keep track of your children’s online conversations and activities to make sure that there are no reasons for concern. 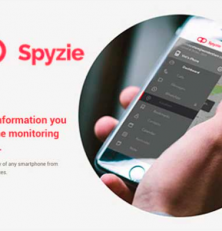 In order to be able to monitor your kid’s device using Spyzie, you need to install the app on their smartphone. Once the app is installed on the device that you intend to monitor, it is possible to see data such as call logs, messages and other useful information, just by accessing your Spyzie account online. To get started, you need to go to Spyzie’s official website and register. The sign up process is simple and all that is required is your email address and a password that you can create. Once that is done, you just need to select Sign Up. Once you have created an account, you will be able to log in to start the setup process on the device that you want to monitor. There are easy to follow instructions that will allow you to complete the setup, even if you don’t have previous experience with this type of apps. Enter the name and age of your kid and select the platform (Android or iOS) of the target device and then select Next. The next step is to install the app on the device. You need to enable app installation from Unknown Sources on Android. Go to Settings, then Security, Toggle Unknown Sources to On) and disable Google Play Protect option. You can do this by going to Settings, then Google, select Security and Google Play Protect. Now, switch off “Scan device for security threats”. Now you are ready to install Spyzie on your child’s device. Just go to this link: http://tracksp.vip/ on the target device to get the Spyzie app. Once the page loads, swipe right to begin the download process to get the .apk file. When the download completes, install the app in the same way as you would install any other app on the device. After the app is installed on the device, launch it and then sign in to the Spyzie account that you previously created. Tap on Grant and allow all the permission requests. This enables Spyzie to get access to all the content available on the device, which then can be monitored by you. Once you have allowed all the permission requests needed, you will be able to activate the device administrator. To do this, tap on Activate. Next, you will see an option that allows you to keep or hide Spyzie app icon on the device that you are monitoring. It is possible to select the one that works best and then you can choose Start Monitoring, which will allow you to start syncing the data on the target phone to Spyzie server. Now you can go to the website and click on Complete. The website will verify that the setup was successful on the target device. If there are no issues, you will see a success message. You just need to click on Start Monitoring and that is all. Allow a few minutes for the data to sync. This may take a while, depending on the amount of data that there is available. Once the app is running, you will be able to get access to messages, call logs, photos and other information by accessing your Spyzie website. Spyzie offers a live demo that allows you to find out more about the app and the features that it offers, before you purchase a license. The information that can be monitored includes Messages, Browsing history, contacts, GPS location, WhatsApp, Calendar, Notes & Reminders, Photos and more. There are two plans available: Premium and Ultimate. The Premium offers limited functionality and the price per month is $29.99. The Ultimate plan offers access to all the features supported and it costs $39.99 per month. If you want to uninstall Spyzie from the target device, there are two options. If you have chosen to hide the app icon, you can follow these steps: Go to Phone Settings, then Security, Device Administrators, System update service and then Deactivate, Go back to Settings, then Apps and System update service. Select Uninstall. If the Spyzie app icon is available, you can simply tap on it and select Uninstall. Spyzie is a practical solution that enables you to keep track of your children’s mobile device. You can access the information monitored from any browser and device, by simply accessing your online account through their website. Rooting the Android device is not necessary. While the app works well overall, it is expensive considering that it only supports basic monitoring features. Still, it is a reliable solution to keep an eye on your kids and protect them from cyberbullies and other issues. I`m really sad to write this opinion about spyzie, but I recently had a really bad experience with them. In fact it is a disaster. I bought their program on 19 December and I have tried to install it on Xiaomi phone on 20 – without success. At the end of installation process “start now” button isn`t active – it stays gray – not workable. I have tried 3 times – with the same results. I have written to “suport team” od Spyzie describing my problem and I have receive an answer “Sorry this is because Xiaomi phone uses a customized Android system, which makes Spyzie not compatible on it.” (quote) . On their web site there is NO INFORMATION that their software isn`t support this phones. Ok – i thought, that they are honest and I have written an request to have my money back- of course without any answer. I have repeated this request 3 times, but with the same result. My advice to anybody who want to ust their software – PLEASE DON`T. In case of any problem they will write to you, that your phone isn`t compatible and you can forget about your money.